Boston’s Q2 series on Smart Buildings and Grid Modernization this past June brought together a diverse crowd of energized and engaged stakeholders to discuss the city’s future energy system. 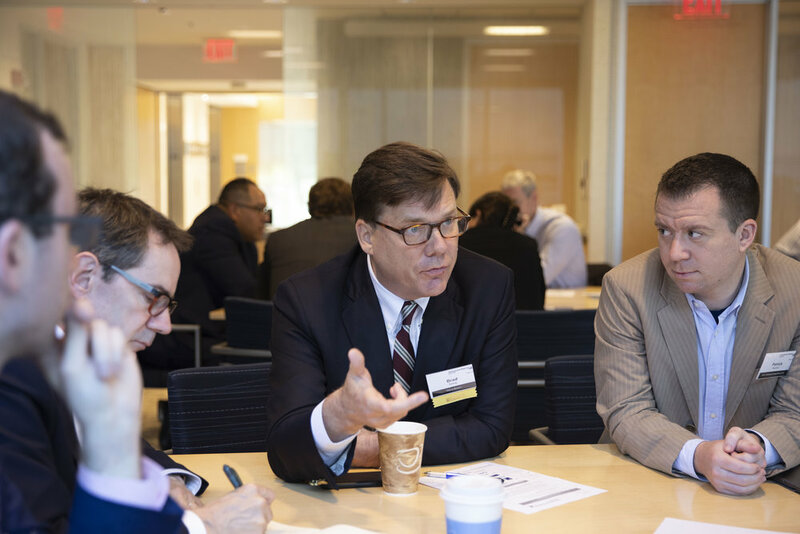 The series entailed a variety of events that provided attendees the opportunity to establish and reinforce relationships, to exchange diverse perspectives, and to take leadership roles within the local energy stakeholder community. The first event was a cocktail hour and dinner that set the stage for the remaining events. A staple of an AEG series, the dinner not only provided a great dining experience, but also the opportunity for its attendees to engage with one another and give their own opinion on the series topic. Attendees were asked to provide a problem statement detailing the fundamental issue in advancing the energy system, within the realm of Smart Buildings and Grid Modernization. Dennis Villanueva, Senior Manager for Energy & Sustainability of Partners HealthCare System, was the first of our speakers and shared his expertise on advanced energy systems for healthcare building operations. Healthcare facilities have been prioritized for energy upgrades due to their critical necessity within society and the importance of reducing energy costs to provide affordable healthcare. These high energy standards include resiliency, efficiency, and utilization of renewables, and the means of executing on these targets includes utilizing grid assets, as well as onsite and off-grid energy assets. Joe Dalton, Project Director of ENGIE’s recently acquired MATEP/Longwood Energy Partners manages the energy system for multiple healthcare facilities within Boston. These buildings utilize the microgrid facility MATEP (Medical Area Total Energy Plant). Joe shared his insights on how energy redundancy is critical for these health and research facilities, and how their strategy focuses on the “3 D’s” of the future energy system: decarbonized, decentralized, and digitalized. Joe also shared his appreciation for how his operations are just one layer out of many systems within the network, which highly resonated with the audience. Jim Hunt, SVP of Regulatory Affairs & Chief Communication Officer of Eversource Energy reminded the stakeholder group of its efficiency efforts that have provided such a great track record for Massachusetts. Jim acknowledged that strong collaboration with the City of Boston was of critical importance, as well as leveraging its positive relationship with its customers. Nonetheless Jim agrees there is still a long way to go in optimizing the energy system. Eversource wants to further tap into its unique customer relationships by implementing demand response programs, and distributed energy storage and EV charging networks. Chris Parent, Director of Market Development at ISO New England, highlighted the demand response programs being planned for the energy market of the future. NE ISO has been actively working for years to effectively integrate demand response into the wholesale market. Key themes include active demand response with distributed generation and storage, and passive demand response through efficiency. Chris also outlined a key difference in language between the ISO and city demand response markets. The ISO talks in units of megawatts, whereas the city demand response efforts are ordinarily referred to in kilowatts. Therefore, Chris claims aggregation of multiple small-scale demand response participants is necessary for effective wholesale implementation. This discussion session utilized a new seating arrangement for AEG Boston, breaking the room into separate tables to compete against one another. During this discussion session AEG also showcased a new piece of technology for the Boston events - an interactive voting system, accessed through each stakeholder’s mobile device. The system allowed equal participation from all attendees, which, combined with its ease of use and display features, really engaged the audience. AEG is always looking to innovate, and to enhance the experience for its stakeholders - on this occasion it was clear the new changes contributed to a lively debate. These results were further discussed in detail to identify the challenges in implementing these solutions. This valuable feedback is considered by the City of Boston and also provides insights for the local stakeholder community. AEG's Boston chapter can conclude this quarter as a success and is now preparing for Q3: Internet of Things.